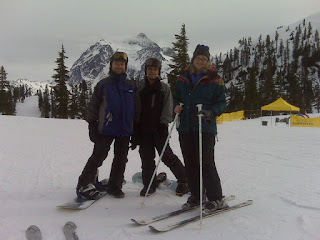 Kathy and I have been promising to take our nephew, Robert, up for Snowboarding lessons this year. 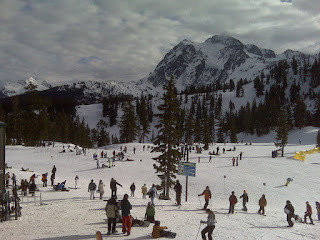 Although Mount Baker may not be the best beginner mountain around, it just happens to be the closest. They also have a pretty good beginner deal. Fifty bucks will land you snowboard rentals, a lift ticket and a lesson. So Saturday morning we loaded our tired hurting heads, picked up Robert and another friend, Jill, for the ride up WA-542. The sun was bright and shining and the weather was hovering right around freezing. The only thing typical about this day for Baker was the near rock iron hardness of the snow. Luckily, the beginner's area was well groomed. We arrived in plenty of time for the lessons and got Robert all situated with boots, board and gear. After that we left him in the capable hands of the instructor (who must have been about 12), and headed up for a couple of runs. All of the non-groomed runs were closed, which is just as well since they were icy and nasty. Well the sun was out and it was warm, so I can't complain too much. 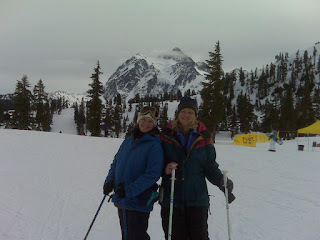 After the lesson, we snapped a couple of pics, just as the clouds started to move in. As for the lesson, it went well. We were able to make it down from the beginner run with only a couple of major wipe outs. Robert is pumped to go again, but was wondering if the snow was always so hard. The only near incident occurred when I realized that I had almost no gas at the top of baker. I think I coasted all of the way down the hill and just managed to coast into the station. Did you know there isn't a gas station in Glacier? Kathy and Jill - Where are your feet? I am unfamiliar with this sport of which you speak. Nice creativity with snowboarding... its amazing. Thank you for sharing.